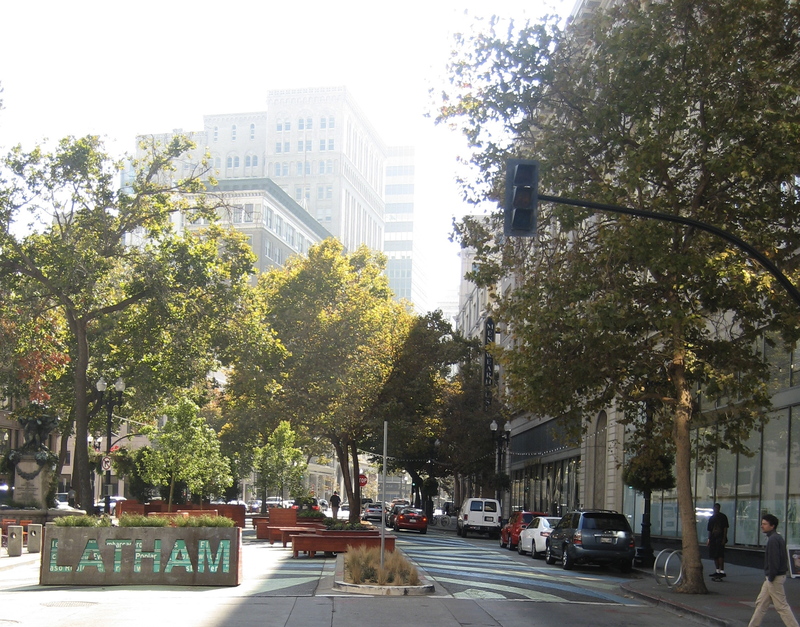 After public pressure, the City of Oakland held a second community meeting Wednesday about the design of the Latham Square pilot plaza, where a lane of car traffic was reinstated prematurely at the behest of Planning and Building Director Rachel Flynn. Despite a standing room-only crowd of attendees showing up to weigh in, the meeting was shut down 45 minutes early. For city officials, the proposal to widen sidewalks but permanently reinstate two-way car traffic at Latham Square appears to be a done deal — though no pedestrian usage data was presented to the public after a six-week car-free pilot period. “I don’t see us going back to the closure” of Telegraph, said Brooke Levin, interim director of the Oakland Public Works Agency. In fact, she added, it is likely the city will reopen the northbound traffic before construction begins on the final design next summer. Before Wednesday’s public meeting, city staffers held an invitation-only meeting on November 15 with City Manager Deana Santana. Invitees included several business owners who oppose the car-free plaza, along with representatives of the Downtown Oakland Association (which supports the pedestrian plaza), Popuphood, Walk Oakland Bike Oakland, and Oakland’s Bicycle and Pedestrian Advisory Committee. But attendees who packed the public meeting, which was not announced on the city’s website until the day before, appeared evenly divided between supporters of the car-free plaza and those who want to bring back two-way car traffic. “We’re not going to satisfy everybody,” Levin told the crowd. City planners’ recommended permanent design for the plaza includes restoration of two-way traffic on Telegraph with narrower auto lanes and an expansion of the existing sidewalk in the triangle between Broadway and Telegraph. Opinions and suggestions for the design were mixed among the 50-plus Oakland residents, merchants, property owners, and downtown workers at the meeting. Even though City of Oakland spokesperson Karen Boyd said “the input from this public meeting will inform and guide the staff recommendation to be presented to the City Council,” it appears it’s already been decided that the recommended design will include a plaza with cars cutting through. Many speakers questioned the city’s lack of data and analysis on pedestrian usage at Latham Square so far during the pilot period. 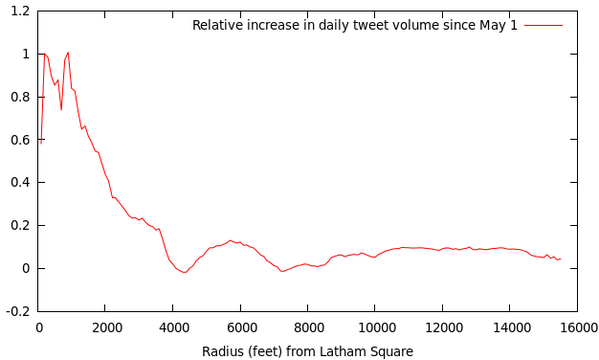 As one indicator of its popularity, a chart tweeted by Eric Fisher shows that the volume of tweets sent out at or close to Latham Square has roughly doubled since May. Among the swirl of different suggestions from attendees, one popular idea was to convert 17th Street to a two-way street, solving the circulation problems for car traffic that city planners cited in the city’s traffic study. Speakers also suggested creating a more flexible space — city planners said their proposed design would allow traffic lanes to easily be closed to cars, but several attendees suggested a curb-less street design, in which cars are allowed, but drivers are expected give priority to pedestrians. Levin dismissed that idea, citing city regulations that require streets to have curbs to facilitate street cleaning. About halfway through the planned two-hour meeting, Levin stepped forward to field questions and offer information, then limited comments and moved to shut the meeting down. When someone objected, pointing out that people were still arriving and it was improper to close a public meeting before the scheduled time, she appeared confused and asked if anyone else wanted to comment, but the meeting had already begun to break up. Levin stressed that there will be a public input session on the design details after the City Council approves the final design in January. People who provided their emails will be notified of the January meeting, but it’s not clear if the meeting will be announced to the general public. When asked how to submit additional comments, city staffers admitted that the city’s Latham Square web page was out of date. Since the meeting, the page has been updated and the online comment link is working. The fate of Latham Square now rests with the Oakland City Council. The public can send email comments to members of the City Council members. That wasn’t Rachel Flynn. That was the Interim Director of Public Works. Interesting use of data (tweet volume by distance from center of the square)! Thanks a lot and good reporting otherwise, too. Thanks, we apologize for the reporting error, it’s been fixed. Names of supposed local merchants who oppose this, please, so I can avoid them. another article mentioned the owner of the rotunda building. I won’t be patronizing the cafe or restaurant there any more. Most of the participants, other than the PW Director, seemed to like the idea of a curbless shared street. My urban design firm, CD+A, has presented the City Council and Mayor with a shared street case study document we prepared. I’ll see if we can post online and provide a link. The hard-to-find “provide your feedback” link on the project website is a questionnaire about the PILOT plaza. This whole project is so shady… But worse, the reported attitudes of the officials involved seem so out of touch with changes happening in surrounding areas. Oakland as it is has WAYYYY too much street space, especially considering the light volume of cars. It’s like night and day with SF. Sure there isn’t a lot of traffic, but guess what, there isn’t enough activity because all there is space for is DRIVING. Businesses need PEOPLE, not CARS. Yes, people are transported via cars, but this stretch of roadway can be so much more than that. ✧ A standing room-only crowd, you say? I wonder how many people that was. Too bad there’s no way to count pedestrians. As a resident, I think the compromise plan, which keeps the space very open, and allows calmed, 2-way traffic some times, with flexibility to shut down traffic for special events, is a great compromise that will do the most to promote walking. People walk when there’s somewhere to go, in particular, stores. Rockridge, Elmwood, Old Town all have wonderful pedestrian crowds without having the roads shut down all the time. Europe is peppered with very active plazas with restaurants, and traffic running down either side. As several folks said in the meeting–the merchants’ matter! And many of the local ones who objected were dedicated Oaklanders who have bet their life’s savings and personal passions on the neighborhood. In addition, one more vacancy or reduced hours is more dangerous to walking than calmed traffic. Also, as a biker, I like biking through that part of Telegraph. When the road was closed I illegally biked through all the time, which is not ideal long term. There should be a bike lane! If that’s the case, then its Oakland developer Phil Tagami who is the problem. He developed and owns the Rotunda Building (along with the Fox Theater) and is one of the developers of the Oakland Army Base project. He’s buddy-buddy with Jerry Brown and Jean Quan. Thankfully, Quan’s days in the Mayor’s office are numbered. Owner and cafe/restaurant operator do not necessarily mean the same thing. There’s no sense in boycotting the cafe/restaurant simply because you disagree with their landlord. The people who are at the restaurants should not be targeted. They are not the problem, the building owner Tagami is. Really?! I think the full closure would encourage foot traffic and increase public safety with since there would be more eyes in the area. Also, I don’t think there are any businesses directly fronting the plaza. Even if there were, I don’t see how direct access to the front door by car is so essential in transit rich downtown. Bikes are allowed through the plaza. I don’t see the need to designated a bike path through the plaza to cater to speeders. The planters and furniture could be arranged to allow bikes through, but at a safe speed. The Oakland urban design office I am an owner of, Community Design + Architecture, provided case studies of shared curbless streets to Oakland council members and staff. A copy can be found at http://tinyurl.com/lathamsquaresharedstreet a cureless design will allow the area to function as a true plaza when traffic is not present, rather than resulting in a return to the Latham Sliver that I mentioned at last week’s meeting. Thank you for mentioning the shocking size (that is, width) of streets in Oakland. Also, I’ve never seen a traffic jam in Oakland as long as I’ve lived here. And by “traffic jam” I really mean that. The streets rarely fall below a LOS C.